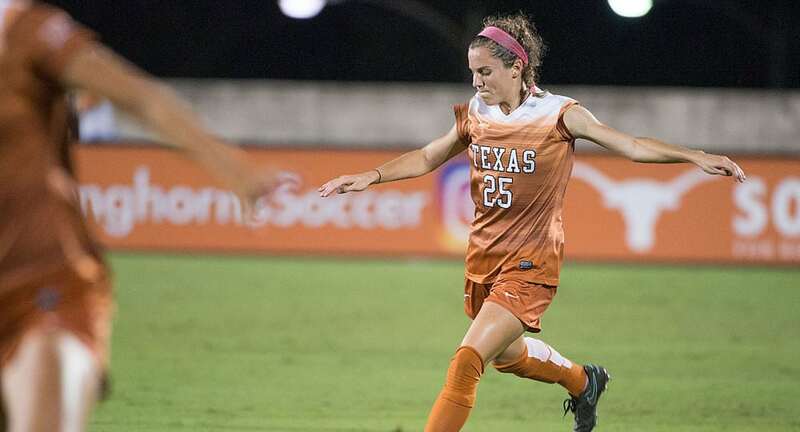 Katie Glenn's second goal of the season was the game-winner as the Texas soccer team knocked off of Texas State, 2-1, Friday at Mike A. Myers Stadium (photo courtesy of texassports.com). AUSTIN, Texas — First-half goals by forward Cyera Hintzen and senior midfielder Katie Glenn and a stingy defense lifted the Texas soccer team to a 2-1 victory Friday over visiting Texas State at Mike A. Myers Stadium. The victory kept the No. 18 Longhorns undefeated, improving their record to 5-0-1 and extended their non-conference home winning streak to 13 straight games. Texas State actually struck first, taking the lead when Kaylee Davis connected in the 16th minute from 14 yards out for her third goal of the season on assists by Sydney Kammer and Renny Moore. Hintzen got the equalizer — her six goals this season are the most for any player in the Big 12 — in the 27th minute on an assist from Alexa Adams when her shot deflected off a defender and into the net. Glenn scored the game-winner in the 36th minute on a goal assisted by sophomore Tecora Turner. Glenn’s tally, her second of the season, proved to be the last goal Texas would need, as the UT defense smothered the Bobcats’ offense. The Longhorns outshot their guests, 19-4, and didn’t allow a single shot over the last 45:22. Texas returns to action at 5 p.m. Sunday at Mike A. Myers Stadium against Houston Baptist in a game that can be seen on the Longhorn Network.